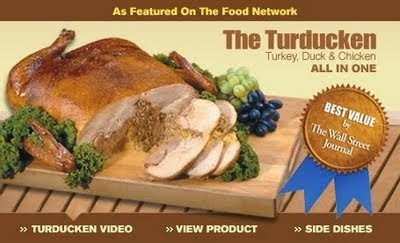 Apparently my local Sobey's isn't stocking turducken this year because they were all getting stolen! So while I lament another turducken-less Thanksgiving - I still haven't tried it - I'll just have to be content to work on my Turducken Portfolio this weekend. Inspiration for Turducken Portfolio ! Yum !!! Just like turducken, as Turducken Portfolio is transparent in terms of what's in it. Unlike other meats where its hard to relate the animal to the food (think pig - pork - ham, or cow - beef - steak), a turducken has a turkey's meat, a duck's meat, and a chicken's meat in it. All stuffed in each other like those Russian nesting dolls. If you can't tell what's in your portfolio and it has a fancy name like Allegro or Alto that doesn't tell you what's in it, like those from Investors Group, then sharpen the Ginsu blade and slide it open for a peek. In the case of many Investors Group portfolio, they are stuffed with other managed funds that follow benchmark indices. Investors Group management fees are to your investment as pan drippings are to a Thanksgiving meal: a slow and steady drip, drip, drip. There is nothing worse than a dried up turkey or investment portfolio that has been drained dry by management fees. As a turducken keeps the taste inside the layers, and a Turducken Portfolio keeps the earnings inside by keeping fee losses low. A BMO Monthly Income ETF has a management fee of only 0.55%. As they say, "ZMI is a fund of fund, the management fees charged are reduced by those accrued in the underlying funds." Holding a range of bond, REIT, utility and financial ETFs it scores high on the Turducken-meter. It yields over 5%. Compare this to Investors Group portfolios that add to the fees of the underlying funds. It may be 0.15%, but in a conservative portfolio with low yields, that drip, drip drip adds up over time. So forget about those starchy Couch Potato investing strategies! Bury that Uber Tuber and dig into a Turducken Portfolio this year!